Saturday the Chicago Bulls (22-57) host the Philadelphia 76ers (49-30) for the second and final time this season at the United Center. The Bulls won the first get together on March 6th, 108-107, thanks to a last-second layup by Zach LaVine to complete a 39-point night. It was the 10th time this season LaVine had scored 30-or-more in a game. Chicago trailed 107-106 after former Bull and current 76ers swingman Jimmy Butler hit two free throws with 4.8 seconds remaining in the game. After a Chicago timeout, LaVine inbounded the ball to center Robin Lopez and got it back, immediately driving hard to the hoop and converting the go-ahead layup. On the drive LaVine was fouled by Philadelphia strongman Mike Scott but went on to miss the free throw with 1.6 seconds left on the clock. Philly was able to snag the missed toss and call a quick timeout. However, LaVine was able to break up Ben Simmons' inbound pass to Butler under the 76ers' basket to seemingly to end the game. However as both teams headed towards their respective locker rooms, the referees huddled at the scorer's table and decided the horn sounded before anyone had touched the ball. Philly was awarded one last chance to win the game with 0.5 seconds remaining. However, in the end it didn't matter as the second inbounds pass to Butler skipped off his hands, as the Bulls and a sold-out UC celebrated the upset victory. 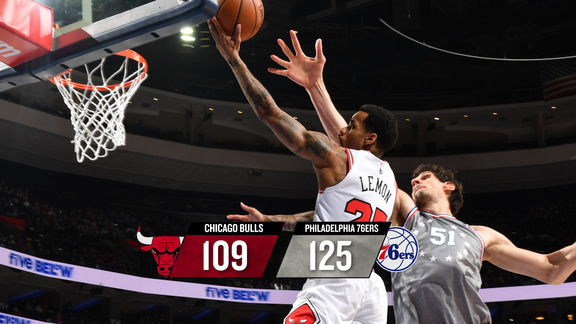 For the game Butler notched 22 points to lead Philly, while Simmons added 18 points, 11 rebounds and seven assists. All-Star center Joel Embiid skipped the game due to a sore left knee. LaVine hit 14 of 26 shots overall on his way to posting his game-high 39 points, while Lopez added 19 points. The win snapped a two-game Chicago losing streak. The 76ers come into tonight searching for a way to get on track after losing at home to Milwaukee, 128-122, Thursday night. It was Philly's third straight loss, and fifth in their last seven games. Embiid returned after sitting three straight games to post 34 points, 13 rebounds, 13 assists and three blocks. However Bucks MVP Giannis Antetokounmpo had another in a long line of monster nights, finishing with 45 points and 13 rebounds to help Milwaukee lock up the No. 1 seed in the East. Antetokounmpo now has recorded 25 or more points and 10-plus rebounds 42 times this year. Philly's JJ Redick produced a strong effort alongside Embiid's, scoring 29 points, while Mike Scott, starting for Butler who sat out with an aching back for the second time in three games, added 22. The loss left the 76ers two games ahead of Boston for the No. 3 seed in the East with three more left to play, including tonight's contest. 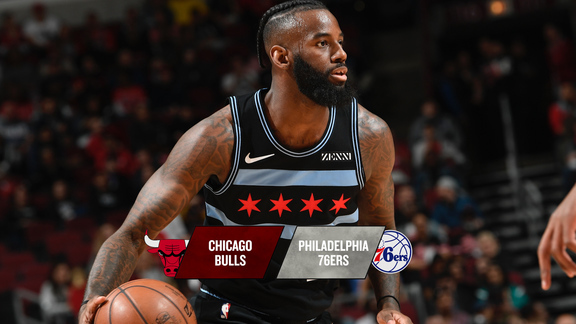 The Bulls hit the home hardwood for the second to last time this season hoping to pull-off another upset of the Sixers and notch a two-game winning streak after beating the Wizards in Washington on Wednesday, 115-114. In just his third game with the Bulls (and eighth overall in the league) point guard Walter Lemon Jr., a Windy City native who played collegiately at Bradley and went undrafted in 2014, scored a career-high 24 points, including two clutch free throws with 1.8 seconds to play, to help Chicago snap a five-game losing streak. Lemon, who spent most of this season playing for Chicago's G League team, the Windy City Bulls, was one of seven Bulls to reach double figures against the Wizards. Fellow Windy City Bull teammate, JaKarr Sampson, backed up Lemon's effort with 18 points of his own off Chicago's bench. The Bulls usual starting point guard, Kris Dunn, was out for the fifth straight game with a bad back and is questionable at best for tonight against the 76ers. Teammates Otto Porter Jr. and Zach LaVine are also likely to miss tonight's contest, as well as Lauri Markkanen who was officially shelved for the rest of the season last week due to fatigue. In order for the Bulls to stay on the winning track this evening they'll have to show up with plenty of energy, fire and focus for the entire 48 minutes of the game. Offensively Chicago will need to keep the ball on the move, skipping it selflessly from player-to-player and from side-to-side, making sure to get everyone involved in the action. They have to make Philadelphia's defense cover a lot of ground by playing fast and doggedly look to attack the basket at every chance. Collectively, the Bulls always need to sport a gritty attitude and be physical, especially in battling to control the paint and when rebounding the ball off the backboard. Offensively and defensively, Chicago needs to establish an ability and the mindfulness to dictate a fast pace to the game. They must look to take advantage of their athleticism, getting out on the break early and often to score easy, uncontested baskets before Philadelphia's defense has the ability to set up and close down all driving lanes to the hoop.